Based on a story that reaches back to ancient Rome and Ovid’s Metamorphoses, My Fair Lady is a timeless tale of the transformative power of love. However, instead of the inanimate statue brought to life in the Latin poet’s conception, Frederick Loewe and Alan Jay Lerner’s fair lady is based on the central character of George Bernard Shaw’s 1913 play, Pygmalion: an exuberant cockney flower seller who would sweep all of society before her if only she could speak properly. Professor Henry Higgins’ bet with his friend Colonel Pickering that he can teach Eliza Doolittle to talk and behave like a lady sets in train a series of comic adventures in which Eliza both infuriates and enchants her companions as she slips in and out of the character Higgins has created for her. He wins the bet, but as Eliza determines to be true to herself, the professor realises that beauty is not skin-deep; it comes from within a person’s soul. 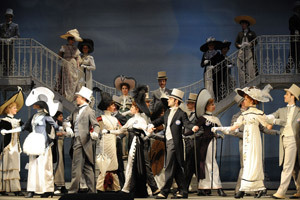 Immortalised by the 1964 film starring Audrey Hepburn and Rex Harrison, the winner of no less than eight Academy Awards, Lerner and Loewe's musical, My Fair Lady, began its life at the Shubert Theater in New Haven, Connecticut. Famously, on its first night on 4 February 1956, Rex Harrison got stage fright. Unused to singing before a live audience, he only performed the show on the basis that those attending would accept that it would still be rough at the edges. Despite this shaky start, the opening evening was a huge success and, after a month of previews at the Erlanger Theater in Philadelphia, My Fair Lady premiered on Broadway at the Mark Hellinger Theater (now the Times Square Church) on 15 March in the same year. Of all the stars associated with the musical, Rex Harrison became the most long-standing, taking on the role of Higgins in the original production in New York, as well as the production that followed in London’s Covent Garden and, of course, the film. The theatrical version of My Fair Lady was also showered with awards, including nine Tonys. Now audiences can enjoy Eliza’s escapades again as My Fair Lady comes to the stunning surroundings of the Volksoper Wien.